A heavy rotation of comfort foods are essential to my winter diet. Pasta, pizza, and wine are regular fixtures on my weekly winter routine. Now, with the addition of Haikan to our neighborhood, a Japanese noodle shop from the same owners of Daikaya, ramen is also contributing to my winter bod. The corner ramen shop named after “pipe works” in Japanese, an ode to its location in the Atlantic Plumbing Building. 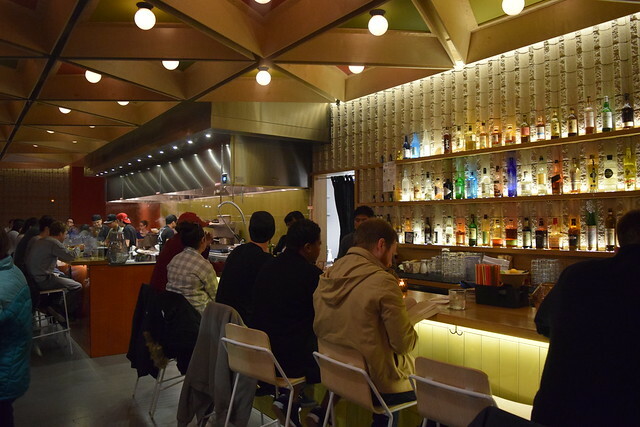 The restaurant has a futuristic, sleek vibe with geometric ceiling panels and wooden communal tables. You enter right past the outdoor patio, which would be nice for warmer months, but as discussed, ramen is my seasonal lover. Come spring, I will have moved on. But for now we’re going steady. As I waited for my sister—the only person in the world who manages to be tardier than me—I noticed the clientele posted up at the open kitchen and bar. Several patrons had a book in one hand and a bowl of ramen in the other, while some were punching away on their laptops, giving Haikan a very casual, come-as-you-are vibe. Our friendly host said we could be seated as soon as our whole party arrived, so 10 minutes later we scooted into a booth. We shed three layers of winter accessories upon seating, so I immediately felt a chill. I opted for the special that night, a warm apple cider cocktail made with Japanese whiskey. It absolutely hit the spot although, admittedly, I couldn’t taste the whiskey while sipping—it hit me about 45 minutes later. Christina tried the draft san-gu-ria, made with wine, yuzu, and hibiscus syrup. It was crisp, flavorful, and light, the opposite of my seasonal drink. Next, we ordered the appetizer special, which we pray makes it onto the standard menu. 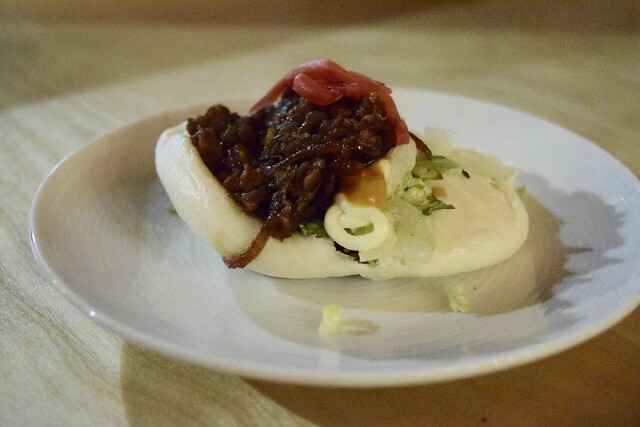 The Cashu bao bun was incredibly light, airy, and creamy at the same time. It was like the Asian version of a sloppy joe. The crisp lettuce, warm meat, and caramelized onions was an outstanding marriage of flavors. Like good sisters, we split the first bun and immediately ordered another. “You eat with your eyes,” as they say, so we were initially turned off by the cucumber salad when it arrived. However, they also say “don’t judge a book by its cover,” which applies to this dish. 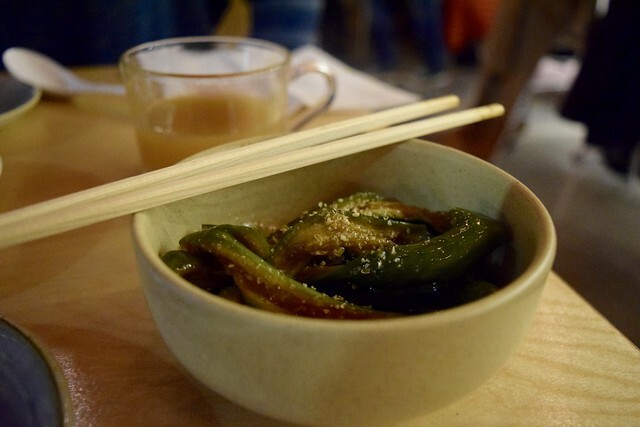 It was served with thick slices of English cucumbers, a smaller, meatier version of a regular cucumber, marinated in a ginger soy sauce. We found that the cucumbers still held a refreshing crunch to them, despite how slimy they looked. I’ve never had a cucumber salad like this version at an Asian restaurant, and was pleasantly surprised. The BBQ egg roll was unreal. 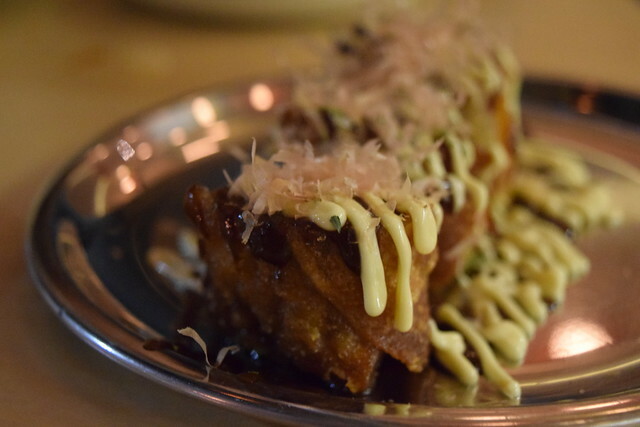 It was served in four pieces that were creamy and warm on the inside with a shell that was fried and crunchy. The exterior packed the perfect amount of grease, and the aioli on top made it decadent–as aioli does. We agreed we would come back to Haikan for this appetizer alone. I’m typically a purist when it comes to food, so I went with the Shio Ramen, made with the Chintan stock, which is clear and delicate, but with a hint of seafood flavor. Haikan’s Sapporo noodles are custom-made in Japan and they are perfect. They have a bit of a kink to them, which adds a nice texture when you’re slurping them up with the rest of the soup’s bounty. Save for the veggie version, all of the Ramen is served topped with garlic, onions, beansprouts, ground pork, nori, and scallions. I always love the crunchy, fresh addition of bean sprouts and scallions to an Asian dish. 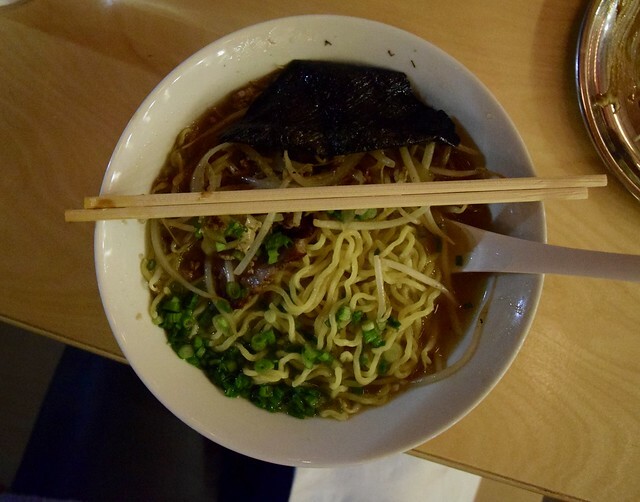 Christina opted for a heartier ramen, the Shoyu. The base comprised a complex soy sauce stock and was topped with half a hard boiled egg. She too noted how delicious the noodles were. The Shoyu was differed from my ramen in that the broth was mildly spicy with deep flavors, perfect for a winter night. 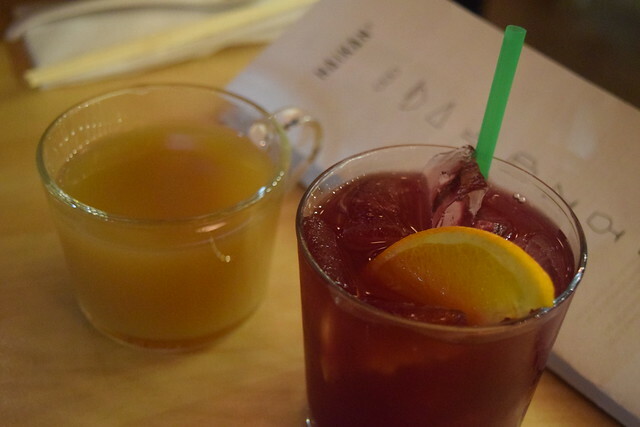 Haikan is a welcome addition to our Shaw neighborhood. 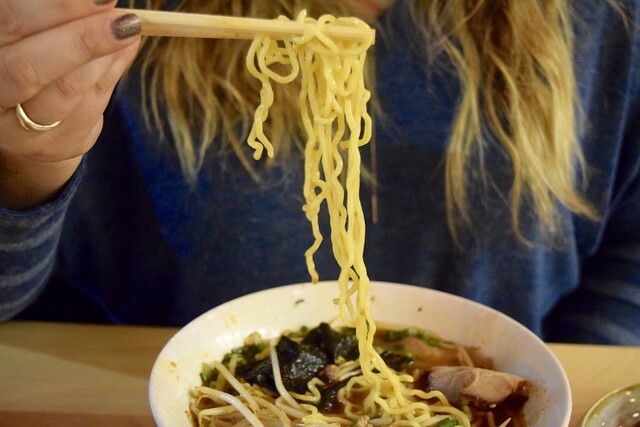 The cool, casual vibes and delicious Ramen make it a great weeknight spot for a date with your sister, boyfriend, or a good book.